A sequel to the Doraemon spin-off series Dorabase, Shin Dorabase follows the story of Tamaemon, who has an affection towards Edogawa Dora’s and idolizes Kuroemon. Unlike the first series, which follows Kuroemon as a batter, this time, Tamaemon is a pitcher with his own magic ball. So? How does it fare? This is the follow-up review to an earlier review I created yesterday, to follow the original Dorabase review. 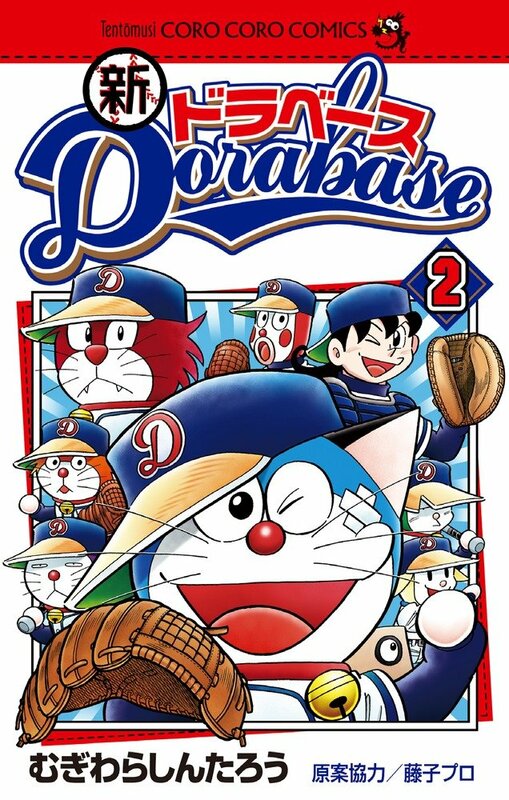 Unlike the original Dorabase series, Shin Dorabase is only collected to a 4 tankoubon volume, making it the shortest of any Doraemon spin-off manga ever released (Dorabase has 23 volumes, The Doraemons has 21 volumes, and The Doraemons’ Special has 12 volumes. ), but the reason why it is only released in just short 4 volumes is justified by it’s content. Shin Dorabase is just riddled with problem everwhere. It’s like when you open the first page, the problem became apparent at that moment too. I’ll just divide it into several section later. Spoiler alerts abound, and of course, since there is no scanlations of this anywhere so I’m afraid I can only attach so much screenshots for this review. First, let’s talk about plot. The plot here is simple, Tamaemon, the protagonist of the story, seeks to join Edogawa Dora’s but the now-coach of Edogawa Dora’s Hyoroemon declared that he failed the test for arriving late. Then, that fire of being rejected burns and now, Tamaemon wants to defeat Edogawa Dora’s in a game of baseball, which he declared is a fun sports every now and then, which I presume must have been his catchphrase. It was simple and as usual, easy to follow, so I’m giving this a-okay. The story introduces us to Tamagawa Dora’s, which happens to share the same first name with Tamaemon, and it’s team. To be honest, other than Tamaemon, Monjyaemon (Or was that Mojyaemon? I don’t know), Jiroemon, and Gonzaemon, no one else gets a character development. They all treated just for the sake of being there. I guess the short volume count has something to do with it, yes? Tamaemon’s rival is Doraem- pardon me, It's not Doraemel, but Noraemon. Doraemel made so much impact when he first appeared and I always thought he was the rival of Tamaemon, mainly due to his development and growth as a character. Even Hyoroemon declared that he and Tamaemon might be the two that shake up baseball once again. Of course, his unique demeanor, and the fact that he hides his hideous face beneath a handsome-looking mask is something to be intrigued for, and when he is unmasked, he goes unhinged but eventually calms down. In my opinion, he was the best character of the series, with Jiroemon coming close second. Jiroemon also had this charm of hiding his face beneath a potato-sack that had a hole for him to see with one eye. Jiroemon is so perceptive that he can tell whether or not a ball is ball or strike, and it’s his ability, which each character in this series are forced to have for some reason. However, the last volume just had to force him remove him potato-sack that makes him so memorable. The author had this strange habit of introducing a mysterious character with hidden face (Remember Aimond? That badass with a cool-looking sunglasses covering his eyes?) and forces them to remove it by the end of the series. For me, that was not a cool move, instead it just removes the air of mysteriousness that character has. And of course, with Doraemel out of the picture, we are introduced to a proper rival to Tamaemon, Noraemon, which I thought to be a last-minute introduction to the series as I believed the author wanted to go forward with Doraemel. Why? Noraemon, unlike Doraemel, is handsome and more collected, much like Shiroemon. And with Tamaemon as fiery as a furnace, the tale of Tamaemon vs Noraemon begins, and it all feels like Kuroemon vs Shiroemon all over again, which for me is kind of bland and flat-out exhausted. I don’t know why the author scrapped that Doraemel plan of being Tamaemon’s rival, but I think it’s mainly due to the publisher’s pressure or fan demands? Why can I say that? I mentioned above that Hyoroemon declared that he and Tamaemon are bound to shake up Edogawa Dora’s. This is said by Hyoroemon, who is the coach of the Edogawa Dora’s and by the time volume 3 catches up, the only hint that Noraemon was going to appear was that bandage next to Tamaemon’s left eye. Oh, and I just have to talk about the number of teams appearing in this story. The number was so low that the excitement of Tamaemon having so many rivals snuffs out by the time fourth volume kicks in. Kuromeon, back in the original series, has so much rival that we can anticipate whomever he’s going to face whenever a new volume kicks in, but this time, we can only assume that Tamaemon’s just going to face a random team each volume, before facing Edogawa Dora’s in the finale. Aside from King Fishers, which is the team that featured Doraemel, nothing else felt remarkable. Setagaya Paamans (A reference to Perman), Sakuragaoka Espers (A reference to Esper Mami), and Bakuden Kigurumis, all of them just there for the sake of being there. And by the time the fourth volume kicks in, I was surprised to see them facing Edogawa Dora’s this early and was even shocked to see that it ends in that volume. The prospect of it having 10 more volumes are there, but I presumed that the popularity of the series just keeps falling as each chapter are published. Well, that’s that, but what about the character design? Good heavens… All of them felt unoriginal and uncreative. Tamaemon is a mix of Chibiemon and Kuroemon, Sho (The only human character of Tamagawa Dora’s) felt like Ruru from the WABC, even Noraemon felt like he was Emoll but bar his perpetual smiler trait. Several felt original and creative, but most of them doesn’t. Who are those that original in terms of design? Of course, Jiroemon and Doraemel. There’s also Kiyoemon, a gigantic batter of the Edogawa Dora’s that felt new. But that’s it apparently. I was surprised to see the magic balls being toned down here. After all, the pitcher is our main character. But, the welcome addition is that the batter also does not use that much different version of batting style, with Doraemel’s V batting the only distinct one. Even Noraemon, the rival to Tamaemon, only had a very long bat and just hits the ball with no ability whatsoever. That, in my opinion, is a welcome addition to the series, but of course, sets aside what a Dorabase truly is. In Dorabase, we learn that there can be so much absurd hitting styles and so many magic balls, but here, it just feels like another baseball manga, but with Dorabase rules. Yes, the Dorabase rules still stands. The usage of 3 gadgets per game still here, but it was underutilized. The original Dorabase creatively utilized every gadget at disposal, but in here, it sometimes just mimics the original Dorabase, such as using big-light and Take-copter again, as well as Weather box, which had similar use to a Weather-spirit ring and etc. The only remarkable one was when Chokoemon uses an Anywhere Door to catch a what-would-be homerun, at the cost of being knocked out. So, there you have it. This series was riddled with so many problems that you can just ignore them all by speed-reading it and think nothing of critical thoughts, much like I did the first time reading it. Characters were unoriginal and dull, contents were lacking, and it was such a short adventure to be honest, and felt like it was rushed by the time it reached the ending. That inclusion of Noraemon also begs a question to be asked as well. Why didn’t the author just go with Doraemel’s direction? After all, by the time volume 3 kicks in, Doraemel’s character has been fleshed out and he was treated majestically, but dumped in favor of more cooler Noraemon. I think only those who had purchased the original Dorabase manga and actually enjoys the content of it that can read this muddy series. This series contains so much reference to the original Dorabase that any reader without prior knowledge of the earlier series might just shook their head in confusion as to who is Kuroemon and the sort. There was a similar series like this, titled Aoki Shinwa Mars, which is the follow-up to Kaze no Sylpheed. Aoki Shinwa Mars, unlike Shin Dorabase, does not made that much reference to Kaze no Sylpheed in it’s first volume, and began referencing them by the time volume 2 kicks in, after we have finally settled with the characters and the horse. That move was remarkable in my opinion. Settling the readers with the characters first before reintroducing characters from the past, and the characters here are mostly horses to be honest, and the only reference this series had with Kaze no Sylpheed was the titular horse of Sylpheed now being treated as a big-time horse and that’s it, with several characters from the past making a return here and there sparingly. That was a good manga to be honest. The good : Doraemel. Lack of Magic balls and batting styles have it’s own charm. The bad : Character don’t get developed that much. Noraemon’s inclusion felt unnecessary. Characters looks unoriginal. Lack of super baseballs might turn off some reader of original series. Shallow plot. Rushed ending. Short in volume count and did not get utilized to it’s fullest. Highlight moment : Tamagawa Dora’s training in uninhabited island. Final score : 1.5 out of 5. There are just so much problem here and this series is only good for those who is yearning for the follow-up to Dorabase.